This is the story of a place that never was: the kingdom of Prester John, the utopia described by an anonymous, twelfth-century document which captured the imagination of the medieval world and drove hundreds of lost souls to seek out its secrets, inspiring explorers, missionaries, and kings for centuries. But what if it were all true? What if there was such a place, and a poor, broken priest once stumbled past its borders, discovering, not a Christian paradise, but a country where everything is possible, immortality is easily had, and the Western world is nothing but a dim and distant dream? Brother Hiob of Luzerne, on missionary work in the Himalayan wilderness on the eve of the eighteenth century, discovers a village guarding a miraculous tree whose branches sprout books instead of fruit. These strange books chronicle the history of the kingdom of Prester John, and Hiob becomes obsessed with the tales they tell. The Habitation of the Blessed recounts the fragmented narratives found within these living volumes, revealing the life of a priest named John, and his rise to power in this country of impossible richness. John’s tale weaves together with the confessions of his wife Hagia, a blemmye–a headless creature who carried her face on her chest–as well as the tender, jeweled nursery stories of Imtithal, nanny to the royal family. Hugo and World Fantasy award nominee Catherynne M. Valente reimagines the legends of Prester John in this stunning tour de force. Why did I read this book: Ever since reading Cat Valente’s The Orphan’s Tales: In the Night Garden and loving it, I have been meaning to read more of the author’s work. 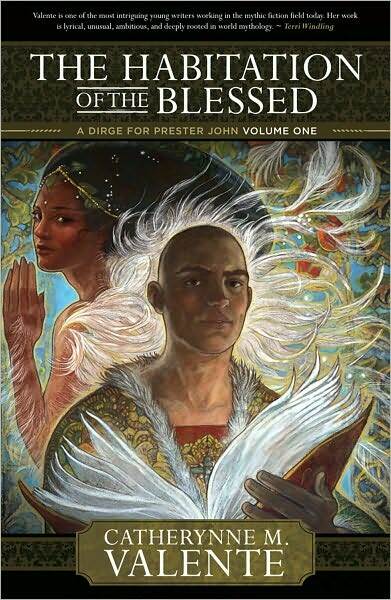 So, when I heard about The Habitation of the Blessed (cover fiasco aside) – and then I heard Cat read a passage from the book before Comic Con – I was completely sold. There is also in our territory a sandy sea without water. For the sand moves and swells into waves like the sea and is never still. It is not possible to navigate this sea or cross it by any means, and what sort of country lies beyond is unknown…three days’ journey from this sea there are mountains from which descends a waterless river of stones, which flows through our country to the sandy sea. Three days in the week it flows and casts up stones both great and small, and carries with it also wood to the sandy sea. When the river reaches the sea the stones and wood disappear and are not seen again. While the sea is in motion it is impossible to cross it. On the other four days it can be crossed. So begins The Habitation of the Blessed, Catherynne M. Valente’s fictional exploration of Prester John – the man, the myth, and the legend. Broken into four different narratives, this novel draws on the legend of the medieval king-priest, with his eastern kingdom of griffins, unicorns, and the font of eternal life. The overarching story is narrated by Hiob von Luzern, a priest consumed with the desire to learn and discover the kingdom of Prester John. His mission takes him through India, to the head of the Indus River in the Himalayas, where he and his brothers approach a striking woman who tells them that King Prester John has gone. The mysterious woman leads Hiob to a tree with book-bearing fruit, and allows him to pick just three volumes from its boughs. When Hiob begins to read his bounty, however, he notices that the books, like any fruit, begin to decay. Frantic and greedy for the knowledge, Hiob begins his transcription of the three books from that knowledgeful tree, and uncovers the shocking, bittersweet truth of Prester John. The first book, the golden volume bearing a cross titled “The Word in the Quince,” follows Prester John as he leaves the battles raging in Constantinople to find the whereabouts of Thomas Didymus, the doubting apostle that disappeared so many years ago in his eastern travels. John finds himself awash on the shores of Pentexore, a land whose beautifully strange creatures all enjoy eternal youth and life. His faith pushed beyond its limits, John struggles to understand how his God and heaven can coexist with such a place as Pentexore. The second book, “The Book of the Fountain,” is writ by Hagia of the Blemmyae and wife of Prester John. A creature of Pentexore, immortal, bearing her mouth on her stomach, her eyes on her breasts, and with no head, Hagia relates her tale of life before meeting the strange, beleaguered priest John – and how everything changed after him. The third book, “The Scarlet Nursery” is the collection of tales told by Imtithal of the Panoti to the three children of the great Queen Abir, countless centuries ago in Pentexore’s history. Imtithal, asked by the Queen to be nurse to her three children so that they might grow to become good people, agrees on the condition that when she is done with her job, the Queen will tell Imtithal her own story. And so, over the years, as the children grow, Imtithal wraps the children in the embrace of her elongated ears, and pours out her heart to them with her stories. Over the course of these three books and Hiob’s own confessional narrative, the story of Prester John, of Hagia, and of Pentexore come to gradual fruition, as Hiob discovers the truth of the legend he has come to pursue. Of Catherynne M. Valente’s books, I have only read In the Midnight Garden – but having now finished The Habitation of the Blessed, there is no doubt that Ms. Valente is one helluva writer. As with The Orphan’s Tales, this first volume in the legend of Prester John is beautifully written palimpsest of sorts, told in an alternating story-within-a-story method, with meanings hidden beneath each carefully rendered layer of prose. The writing itself is lush and poetic, creating an image of the world that is strange and beautiful, rife with alternate customs and mysterious histories. The driving conflict of the three tomes within Hiob’s own narrative is that of John and his beliefs, in stark contrast to the reality he finds himself in with this strange new land. While the immortals of Pentexore listen to John’s ersatz religion and his inexorable belief in his God, the wonder of this new world – through the eyes of John, Hagia, and Imtithal – push to a reckoning. While the style of the writing is superb and the plotting and nature of the story is very revisionist and awesomely blends fiction, history, and religion, there is a conflict when it comes to characters. In this kind of book (or any book with alternating POVs), not all stories or characters are created equally. I found myself in love with Hagia’s narrative, but even moreso with Imtithal’s stories to her three beloved child charges. In contrast, Prester John is…well, he’s not a character that I particularly liked (not that liking him is the point, I know that!). I found myself rather like the different creatures of Hagia’s world – tolerant of John’s foibles, but tired of his many prejudices and pigheadedness. In the grand scheme of things, I found myself drawn to the other books – even Hiob’s written confessional – than John’s story. That said, I loved this book as a whole, and the way this book ends, or rather, how John and Hagia’s story leaves off, is a wonderful hook for the next book. I’ll be back, most definitely. Notable Quotes/Parts: You can read a nice, healthy excerpt online HERE, drawing from all narrative points of view from The Habitation of the Blessed. For more about the legend of Prester John, you must check out Cat Valente’s wicked action-figure video. Seriously. Spider-man may be Jesus. You need to watch it. Additional Thoughts: We were thrilled when Catherynne Valente agreed to be a guest author for Smugglivus 2010 – make sure you check out her guest post from earlier today, in which she details her favorite books of the year, and talks about her upcoming projects for 2011 (including The Folded World, book 2 in the Prester John series). Fantastic review, Thea! I just finished this one recently and completely agree about the different stories. Imtithal’s was wonderful as well as Hagia’s, but John’s wasn’t quite drawing me in. Not that he was poorly written since as you said that was the point of his character, but his perspective wasn’t as compelling to read as the others. Like In the Night Garden, it is a beautiful book, though. Oh, I had no idea this was out! I loved the two books by this author that I’ve read so far, In the Night Garden and Palimpsest, so I am looking forward to reading this one, too. She’s a fantastic writer. Oh my god, that youtube video cracked me up. I’m definitely going to keep an eye out for The Habitation of the Blessed.